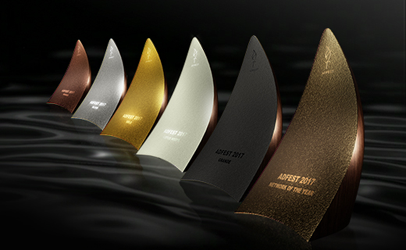 To commemorate the 20th Anniversary of AdFest, a new trophy has been designed for the Lotus Awards which are handed out each year to the best advertising in the region. The new Lotus trophy was designed by Jovert O. Bantilan, Mark Ngo and Jimmo Garcia of DDB Philippines. The team took their inspiration from the lotus flower that begins life as a humble seed but blossoms into something special. Eight trophies form a full circle of petals. Jimmy Lam, President of AdFest said that out of the 40 designs submitted, this design from DDB Philippines stood out for its simplicity, humility and symbolism. Vinit Suraphongchai, Chairman of AdFest thanked everyone who entered and said the committee was overwhelmed by the quality and originality of the entries. Bantilan, Ngo and Garcia also designed a certificate to go along with the trophy.